Do you listen to the Genealogy Guys podcasts? You should, you know, and not just because The Legal Genealogist was the guest of host Drew Smith in the Genealogy Connection episode just published on June 17th. These podcasts are chock full of great information from Drew and co-host George G. Morgan about events in the genealogical world, book reviews, resources that are coming available and much more. The podcasts are about 30 minutes long, can be easily downloaded to an iPad or other device for mobile listening and give us all a great way to stay up on what’s happening in genealogy. 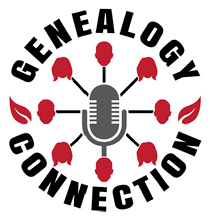 The Genealogy Connection series provides an opportunity for listeners to get to know individuals in the genealogical community better, and it’s this series I want to highlight. Guests in the past have included some great friends of mine and people I certainly enjoy listening to: my recent traveling companion Helen Smith of Australia in episode 12; a dear friend and genealogical mentor David McDonald in episode 13; Cyndi Ingle of Cyndi’s List in episode 4. But one of the very best things that Drew and George are doing with this series is highlighting some of the youngsters of this field of genealogy — and all I can say is, the future is in very good hands indeed. • Paul Woodbury, a DNA expert at Legacy Tree Genealogists, in episode 17. • Mary Tedesco, one of the hosts of Genealogy Roadshow and a specialist in Italian and immigration research (see OriginsItaly.com), in episode 15. • Katherine Willson, a specialist in midwestern US research (see Socialmediagenealogy.com), in episode 14. • Colleen Greene, an academic librarian at CSU-Fullerton who specializes in both technology and Mexican research (see Colleengreene.com), in episode 11. • Blaine Bettinger, author of The Genetic Genealogist blog, in episode 8. • Rich Venezia of Pittsburgh, an expert in Italian and Irish research (see Rich Roots Genealogy), in episode 7. • Jen Baldwin, North America Data Licensing Manager at Findmypast, in episode 3. • Jessica Taylor, president of Legacy Tree Genealogists, in episode 1. How many of these best and the brightest of our community’s young stars — rising and already risen — have you met yet? Thanks, Drew and George, for highlighting just how bright our community’s future is. Thank you, Judy! Drew and I have been podcasting since September of 2005 and are more enthusiastic about it than ever. There is a great need for genealogy news, interviews, book reviews, and other diverse materials. We love our listeners’ email messages. They provide us with information and pose excellent questions for us to research and respond and to share with the community. I can’t tell you how many times one listener’s email question or perspective has helped another listener, and then we receive email from them explaining how it helped. Our Genealogy Connection podcast does bring interviews to our listeners, and we are excited about the younger genealogists too. There is a great deal of talent among them, an understanding of technology and DNA, and they bring fresh excitement to genealogy. We’re actively contacting genealogists, authors, lecturers, software developers, database providers, DNA experts, and so many others for future interviews. We’re also working to make The Genealogy Guys Podcast and the Genealogy Connection podcast more accessible from many platforms. We’re here for the long haul, and truly appreciate all that YOU do! “We’re here for the long haul” <-- best words ever! I saw you in Sacramento and heard your interview with Drew and both times you were engaging and I learned so much. Thanks.